If you’re a hunter then you’re probably aware of the goodness of a holographic sight. The mechanism behind a holographic sight is that it incorporates a laser transmitted hologram of a reticle that’s transferred back to your eyes through a series of lenses. 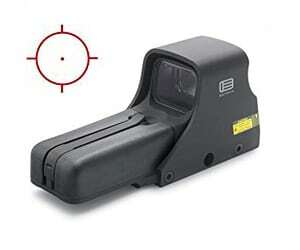 A good holographic sight will help to increase your accuracy to a great extent. EoTech is the father of holographic sights and the EoTech 512 is one of their finest creations. There is a pool of holographic sights in the market but if you’re looking for a holographic sight that will provide you with the best view at your target the EoTech is your guy. Holographic sights are designed specifically for close range shots and they are used by many pro hunters as well as law enforcement agents. The EoTech 512 is not an average Joe. It has a robust quality and packed with an incredible number of features. It is suitable for people who want to have a clear shot at their target in a close range. The solid build quality and top-notch features make it an ideal holographic scope for the professionals. The EoTech 512 has a very sturdy and durable construction. It has a robust build quality that will last you through the most extreme condition without any scratch or dent. The EoTech 512 is one hell of a tough gear yet it doesn’t have an overpowering weight. It weighs only about 10.9 ounces while delivering rock-solid performance. The 512 features a shatter-proof glass laminate placed near the rear window. It has water-resistant properties up to 10 feet under water. It also has incredible shock-resistance properties so even though there’s an apocalypse taking place, your EcoTech 512 will stay intact. This scope can withstand a temperature range of -40 to 140 Fahrenheit. Thanks to its incredible fog-proof technology which will keep the lens clear without any fogging even when there’s an extreme transition between temperatures. The EoTech 512 has a field view of 30 yards offering crisp and clear visibility through the area. This holographic sight is an incredible choice for shot ranges. There are 20 different brightness settings, however, bear in mind that this doesn’t offer any night vision mode. So, if you happen to go on plenty of hunting quests after dusk then you may need to avoid this one. But, there are different brightness settings so that you get the best out of it even in low light conditions. This holographic sight comes with a 1 MOA aiming dot inside a 65 MOA circle dot. The A65 reticle is suitable for both close and long ranges. Also, the small MOA of 1 gives it a better and more precise shot at its target. However, it performs better within a close distance. A parallax error occurs when the target gets shifted from its original position when seen through the holographic sight. The optics on this sight are parallax free so you’ll face no such issue. It will give you a crisp view with plenty of details even without any magnification. However, it offers magnification up to 1x so that you can have a better look at your target. EoTech features a limited warranty of ten years. If you’re looking for an unlimited warranty that doesn’t ask for ownership or money receipt then the EoTech 512 would not be a good choice for you. Although, it has a solid construction with incredible durability. Hence, an unlimited warranty is not much of a concern though. The EotTech 512 is powered by regular AA batteries. They offer outstanding battery life so you don’t need to worry about the battery dying in crucial situations. It can run for 500 hours straight so that gives you plenty of time before looking for a new pair of batteries. What is the country of origin of this product? Ans: It’s made in the USA. Does it have night mode? Ans: No, the Eotech 512 does not feature the night vision mode. What sort of mount setting does it have? Ans: The 512 is compatible with 1″ Weaver as well as MIL-STD 1913 Rails. EoTech holographs are the pinnacle of the holographic sight. The EoTech 512 is one of the best holographic sights that you can get for your AR-15. The easy adjustment system along with superb A65 reticle makes one of the best in the market. The price might seem like a splurge. However, its superior performance will make up for it as soon as you get your hands on it.